“Brass decor” usually calls to mind images of solid metal items. 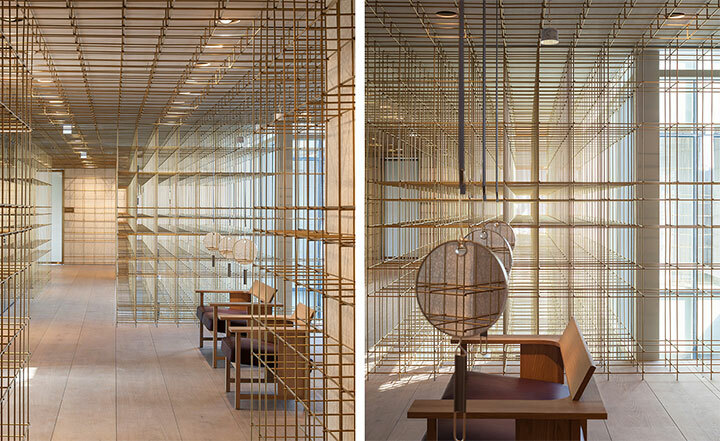 However, a Shanghai-based design office managed to use brass to create the feeling of transparency and give a five-story space the vibe of a delicate Oriental lantern. 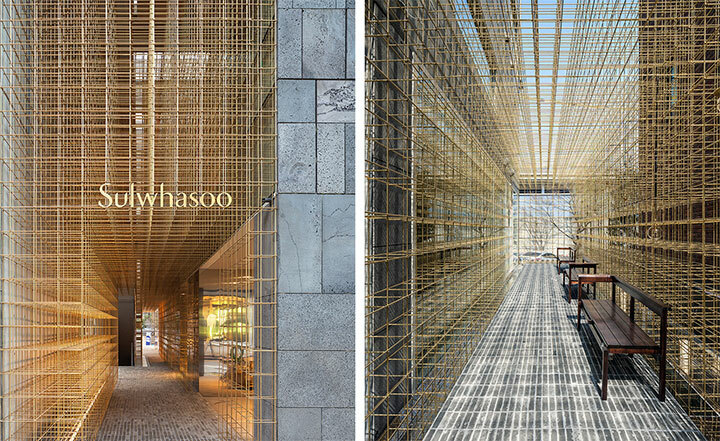 Designed by Neri & Hu, the project was completed for Sulwhasoo, a Korean skincare brand, and its first standalone store, located in Seoul. More than a simple retail space, the store included two separate spas and dedicated areas for things such as the development of a cultural program and services for VIP customers. 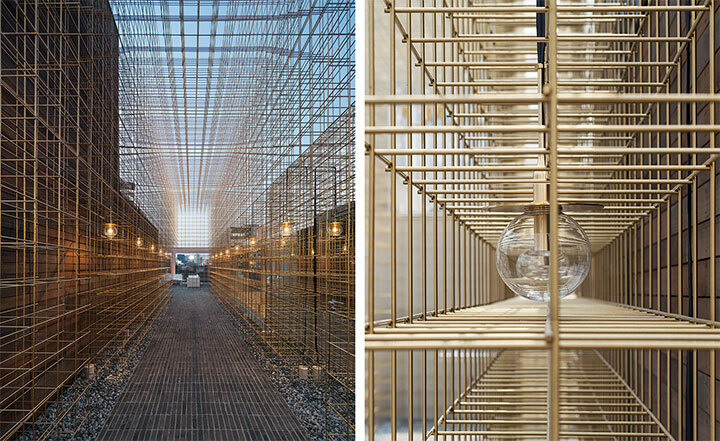 The designers achieved a cohesive look by creating a brass structure that begins outside and continues into the building. Long lines are intersecting at straight angles in a gold-tone construction of brass filaments. 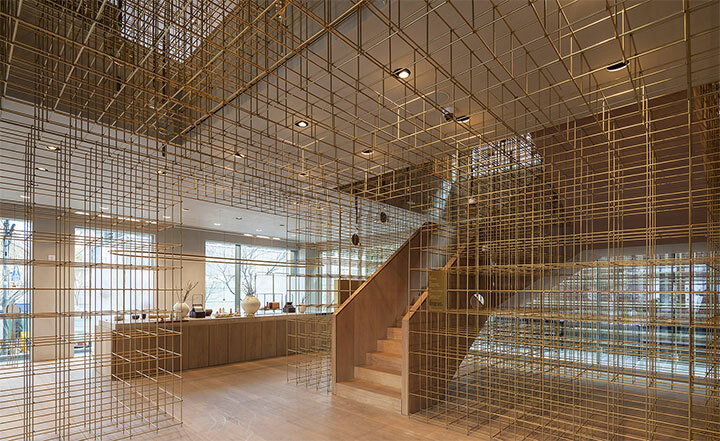 From a visual standpoint, this unique brass construction achieves a difficult purpose: it gives the space an ethereal vibe by using massive metal structures. In addition, it is easy to imagine how, without this network of brass filaments, the interior could easily fall into the monotony of large, empty spaces. 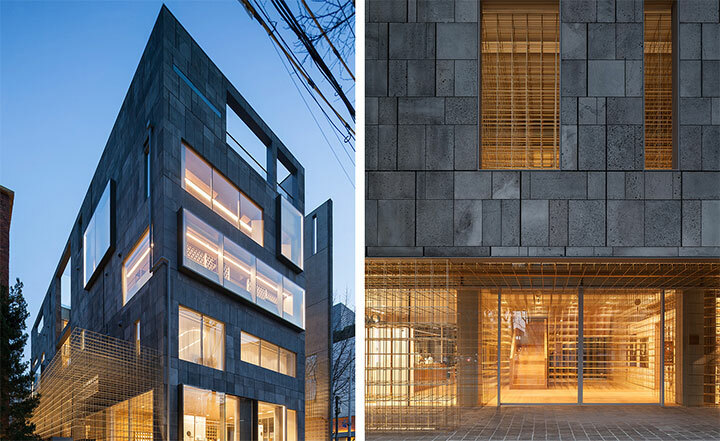 Surprisingly, by incorporating this svelte, vertical structure into the interior design, the openness of the interior is emphasized rather that undermined. It is as if the empty spaces in the brass construction invite the eye to peek into and explore corners that would otherwise be ignored. Through the smart use of this metal web, the place is completely redefined. Emphasizing the idea of openness and transparency, clear spherical light shades balance the coldness of metal and the straight angles of the structure. Beyond its aesthetic role, this construction has a definite functional value. 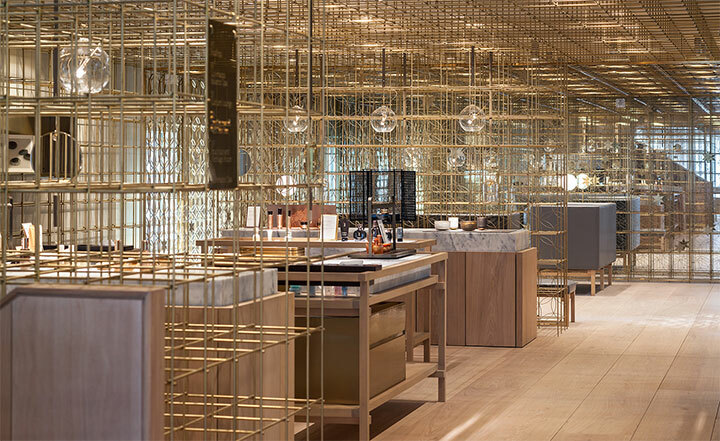 As space dividers, the brass filaments help in separating functional areas without undermining the open feel of the space, while allowing the light to reach every corner of the store.